My family went to Disneyland for a week last summer. My mom (also a postcard and stamp collector) spent an entire day looking for postcards, stamps and a mailbox on the Disney property. We were hoping to get a special Disneyland postmark, like the Harry Potter “unofficial” postmark at Hogsmeade at Universal Studios Orlando. Finding the postcards was not too difficult – although the selection is somewhat limited and all of the shops carry the same postcards. None of the cast members at the souvenir shops knew where to mail the cards or if there was a special postmark available. She finally went to Guest Relations by the front gate. The woman at the desk told my mom she could mail her card there, but there was no special postmark – all of the mail gets routed through the Santa Ana post office. 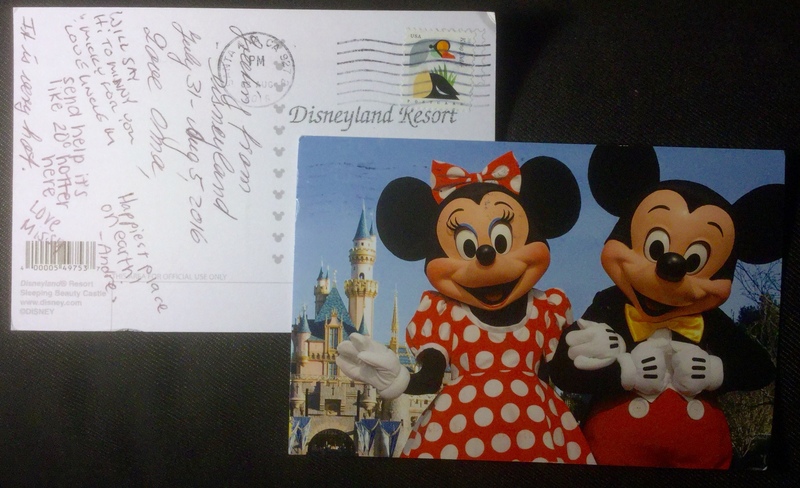 However, she did have a “Disneyland Resort” rubber stamp and would stamp the postcard with that. You can see that in the top photo, just below the stamp. I think Disney is missing a HUGE opportunity here. 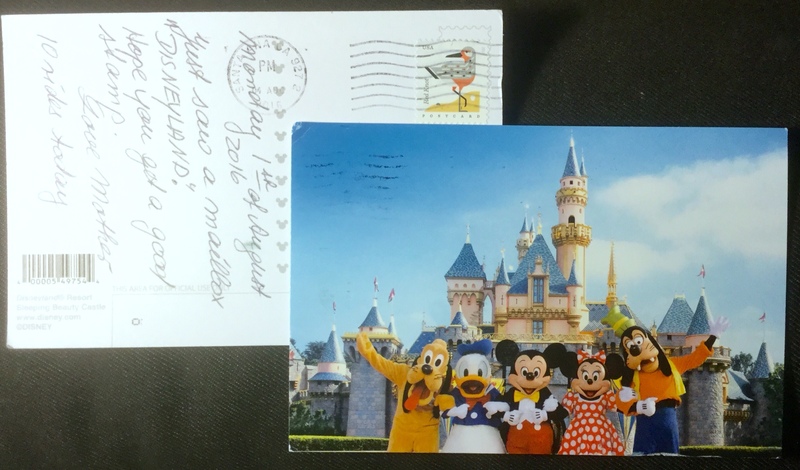 What a great souvenir for a photo album, travel journal, or refrigerator – a Mickey Mouse postcard with a special postmark (maybe something with mouse ears?) signed by the whole family (including the little kids). It’s a family bonding activity and the stuff that memories are made of. Also, just so you are prepared, look at the postmark on the second postcard. It is postmarked Aug 4th (Thurs) and my mom mailed it Aug. 1st (Mon). The postcards did not arrive in Seattle until the following week. Just be warned, this is truly a snail mail service. This entry was posted in The Tuesday Post and tagged Disney, mail related, postmarks. ← Max Mondays: Yay! It’s Root Vegetable season!